Release Date: May 18th, 2007 by Paramount Pictures. The Voices: Mike Myers, Eddie Murphy, Cameron Diaz, Antonio Banderas, Julie Andrews, John Cleese, Rupert Everett, Eric Idle, Justin Timberlake, Susanne Blakeslee, Cody Cameron, Larry King, Christopher Knights, John Krasinski, Ian McShane, Cheri Oteri, Regis Philbin, Amy Poehler, Seth Rogen, Maya Rudolph, Amy Sedaris, Conrad Vernon, Aron Warner. 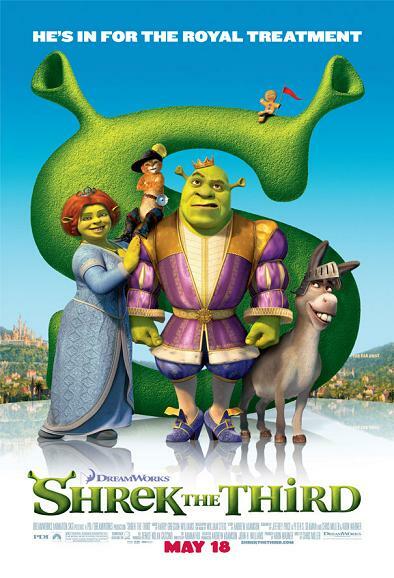 BASIC PREMISE: When King Harold (voice of John Cleese) dies, Shrek (voice of Myers) and his sidekicks, Donkey (voice of Murphy) and Puss in Boots (voice of Banderas), set off an adventure to find Arthur (voice of Justin Timberlake), the next heir to the land of Far, Far Away. ENTERTAINMENT VALUE: Shrek the Third has a few funny scenes, but, for the most part, the humor falls flat because doesn’t go far enough compared to the last two Shreks. While Shrek and his sidekicks look for Arthur to replace king, Prince Charming (voice of Everett) tries to take over the kingdom. Arthur lacks the confidence to become king, though. Also, it turns out that Shrek’s wife, Fiona (voice of Cameron Diaz) is pregnant. The plot basically turns into an action film with a little bit of drama and a sprinkle of comedy. What seems to be missing here is all those clever sight gags that fans expect to see as well as witty dialogue. A total of five writers wrote the screenplay, including Chris Miller, so that might explain why the plot becomes unfocused and somewhat chaotic. Unfortunately, that doesn’t explain how none of the characters manage to provide the much-needed comic relief—even Donkey, the funniest character from the other films, is underused and dull this time around. How funny can it be for Sleeping Beauty (voice of Cheri Oteri) to fall asleep a lot? When Merlin (voice of Eric Idle) the wizard magically makes Puss in Boots and Donkey switch bodies, it might sound funny on the page, but not onscreen. Even Happy Feet and Hoodwinked! had much more imagination and humor. Fortunately, the CGI animation looks very vibrant and quite often realistic, especially when it comes to bristling hair and grass. The backgrounds also show attention to lifelike detail. If only more attention—and money—were spent on including more of the trademark Shrek humor, this would have been much more entertaining. It would have been helpful to include some outtakes at least, but, hopefully, that will be included in the DVD extras. IN A NUTSHELL: Sporadically funny with brilliant CGI, but as not clever, imaginative or laugh-out-loud funny as expected.